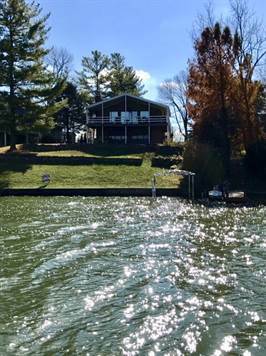 WATERFRONT all brick raised ranch on just under a half acre. The home offers 3 spacious bedrooms, 2 full baths, updated kitchen with walk in pantry, stainless appliances, glass mosaic tile back splash and laminate flooring, great room with vaulted ceiling and stone wood burning fireplace, custom stone work throughout the home, laundry shoot to basement laundry room, excellent swimming and fishing cove with sandy bottom, pine tree lined property line, large covered rear deck with outdoor ceiling fan/light to keep cool. House located at the center of the lake on a hill. The home also offers new flooring and paint through out the main level as well as light fixtures. The main level is 1344 sq ft with another 1244 that could be finished in the basement. The basement includes a two car garage but could easily be converted to more living space. There is so much potential within this property. Come check out all this property has to offer! No showings during the week only the weekends until further notice. Thanks!